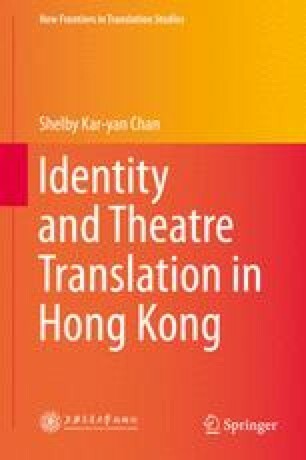 This chapter presents an analysis of the statistics of theatre translation in Hong Kong during the period 1980–2007, i.e., from the beginning of the Sino-British negotiations on Hong Kong’s sovereignty to a decade after the 1997 handover. The purpose is to plot the trend of theatre translation and to draw a map of Hong Kong’s identity politics through theatre translation, with a focus on the local-foreign relationship and identity borrowing. One of the central questions articulated by identity politics in Hong Kong is the interaction between the Self and the Other. Hong Kong Arts Centre’s Official Website. 2010. Shouson theatre. http://www.hkac.org.hk/en/facilities_shouson.php. Accessed 8 December 2010.
Leisure and Cultural Services Department’s official website, HKSAR. 2007. LCSD performance venues. Last updated 16 February 2007. http://www.lcsd.gov.hk/en/cs_pa_venue_search.php?action=indata&cat=1&dist=0&Submit=Search. Accessed 8 December 2010.